It's that spooky time of year again! Our cozy characters are popping out of their books to talk about their preparations. When I was a kid growing up in Chicago, we did all kinds of crazy things on Halloween. My parents dressed up, and so did my neighbors. In Sweet Pepper, Tennessee, where I live now, houses are further apart so there is a big Halloween event in town where everyone goes trick or treating. They dance, and tell spooky stories about ghosts in the Great Smoky Mountains. I'm Fire Chief Stella Griffin from the Sweet Pepper Fire Brigade Mysteries by J.J. Cook. I live with a ghost now, and I can tell you - ghosts aren't as scary as they are annoying! Happy Halloween! 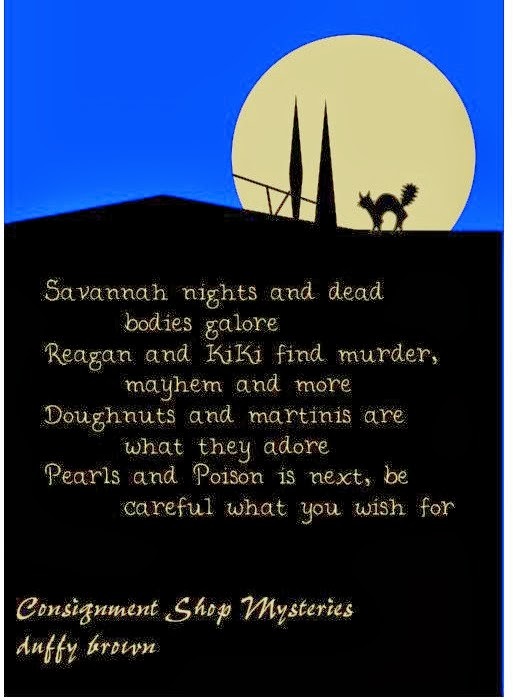 Pepper Martin from Casey Daniels's Pepper Martin mysteries reminds you that there's only one real place to celebrate Halloween . . . I'm Lizzie Turner from the Ashton Corners Book Club Mysteries by Erika Chase and what I remember most about Halloween as a kid is hiding m my not-so-secret cupboard and reading scary books by flashlight. Of course, I'd have a bag of carmel candies with me, too. My favorite Halloween read -- an old battered copy of Georgie by Robert Bright. I'm Daniel Yazzi from the Crystal Shop Mystery, Alibis and Amethysts, by Sharon Pape. My cousin George and I run Jeep tours through the Red Rock country of Sedona, Arizona. During our first year of operation, we went all out for Halloween. We even hired some teenagers to dress up as ghouls and ghosts and jump out from behind the boulders we passed. It was a lot of fun, until one the older tourists appeared to suffer a heart attack. Fortunately, it turned out to be just a panic attack. But now we celebrate the holiday with nothing scarier than cidar and pumpkin pie. 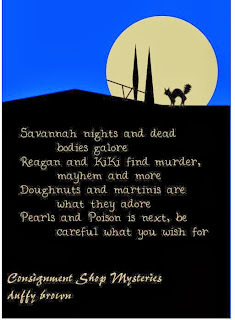 Rita Lucero here from Zydeco Cakes and the Piece of Cake Mystery series by Jacklyn Brady. For the people of New Orleans, Halloween is just another good reason to celebrate. It's second only to Mardi Gras for getting wild and crazy, and it's definitely not just for the kids. Wherever you are today, have fun, eat well, and be safe! Hi. Jenna Hart chiming in. One of my favorite memories of Halloween was making costumes with my mother. She was a whiz with a needle and thread. My favorite costume? When I was Glinda the Good Witch of the North. My mother created a see-through bubble that went from my head to my waist. Luckily she had the foresight to poke holes in the bubble so I could breathe. I love the Wizard of Oz books. Did know know there's a Wizard of Oz cookbook? Did you know there's a Harry Potter cookbook, too? I'm learning so much as the new owner of The Cookbook Nook and café in Crystal Cove, California. Stop in to browse our shelves and taste some of some of Chef Katie's fabulous sweets and treats! 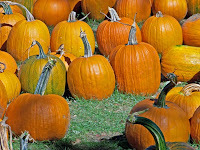 Cookbook Nook mysteries by Daryl Wood Gerber. Happy halloween!!!! Lauren Vancouver from the Pet Rescue Mystery Series by Linda O. Johnston chiming in here. Since my kids are grown and in college, I'll be spending Halloween at my no-kill pet shelter HotRescues with my rescued animals making sure no one tries to trick any of them. Of course I'll be treating them. Happy Halloween, everyone! In the Village -- aka Jewel Bay, Montana, aka the Food Lovers' Village -- little ones from far and wide dress up and come into town for treats from the Village merchants. It's my favorite afternoon of the year, as pumpkins with legs, ghosts, superheroes and princesses take over. Keeps them safe, and let's the rest of us in on the fun! My nephew Landon still can't decide between being a Jedi Knight and Superman. Come on down to the Merc and see what he chooses! Happy Halloween! Erin Murphy, proprietor, the Merc, the heart of the Food Lovers' Village Mysteries by Leslie Budewitz. I'm Willow from the Threadville Mysteries by Janet Bolin. When I was a little kid, I was afraid to go trick or treating to houses that were too spooky, like that ghost who was sitting in a chair reading poetry in a sinister voice So I decorate the porch of my embroidery shop, In Stitches, with pumpkins, gourds, corn stalks, and urns of mums. And I hang a few ghosts, the cute kind, not scary ones, from the tree in front. Boo! 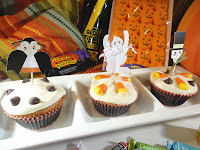 Daphne Martin says you should check out the Black Cat Cupcakes at her recipe page. Bwahahahaha! Faye checking in. I've never been invited before, but now that Halloween is upon us and the barriers to ghosts are almost gone, I'm popping in to say BOO! I used to own Sophie Winston's house in the Domestic Diva Mysteries. Sweetheart that she is, she keeps my portrait over her fireplace. I try to behave myself. After all, I don't want that Natasha in my house! Then I'd have to get busy haunting the place. Nope, I'm very happy with Sophie. And my spot over her mantel is the perfect place to listen in when her friends come by to talk murder. Still, seeing as how I was able to come here, maybe I'll head over to Natasha's and moan a little bit to rattle her. Hehehehe! Myrtle Crumb says, "All right, young 'uns! Make a plan to go out tomorrow and get that half-priced Halloween candy to use over Thanksgiving and Christmas. Go early, or else all us old people will beat you to it. And, by the way, my latest book, CLAUS OF DEATH will be F*R*E*E on Amazon November 5 and 6. Make a note of that because free is even better than half-priced." They came by the droves, in packs, flocks, herds. With parents and grandparents, in strollers and on foot. Loved loved loved the toddler pirate twins! The bunny sisters, with colored sparkles in their ears. Black cats and brown dogs. Superheroes galore -- some I couldn't even identify! Two little girls dressed as doctors -- not practicing together. Ghostbusters. Pumpkins. And of course, the classic ghosts, witches, and skeletons. I found an Elizabethan gown perfect for a princess, and Fresca dressed as a witch. Tracy came as a cowgirl, with lariat. So glad we had a giant kettle of candy! Now time to get out of this bodice-squisher and eat the leftovers -- with my very own black cat companion! I hope you had a treat of a day! Wow, I'm glad all of the characters from my favorite mysteries had a Happy Halloween!